One of the current military strategies is to “Rule the Night”. Basically, this means that you take away from the enemy the ability to control the darkness and make it an advantage to you. While I never thought of trout fishing in a military sense, the thought might work if applied to the Michigan Mayfly (Hexagenia limbata) emergence around the end of June. To fish this emergence successfully, you have to develop the right strategy and tactics. Somewhere around 1972 I was told by some of the old timers along the Pere Marquette that if big fish were my goal I should fish the Hex hatch. Their description of the “method” really got me curious. When I asked if one of them would take me out on one of these excursions you would have thought that I wanted to date their sister. These guys would share a drink, tell you what the hot fly was and even give some to you, but reveal the Hex hot spots produced a stony wall of silence. My curiosity being suitably aroused, I asked “how do you do it”? That information, revealed the how, what and why but left out the most important item, the where. Here is what I learned. Find a place where you think the “big ones” would hang out. There should be silty and mucky bottoms nearby. Find access points and wading areas that are not too difficult to navigate and that can be found in the dark (using lanterns and lights other than on a sporadic basis can turn off the fish). Practice wading through the selected areas and try to find streamside landmarks that tell you where you are and would help avoid hazards. Fish with a partner or two. 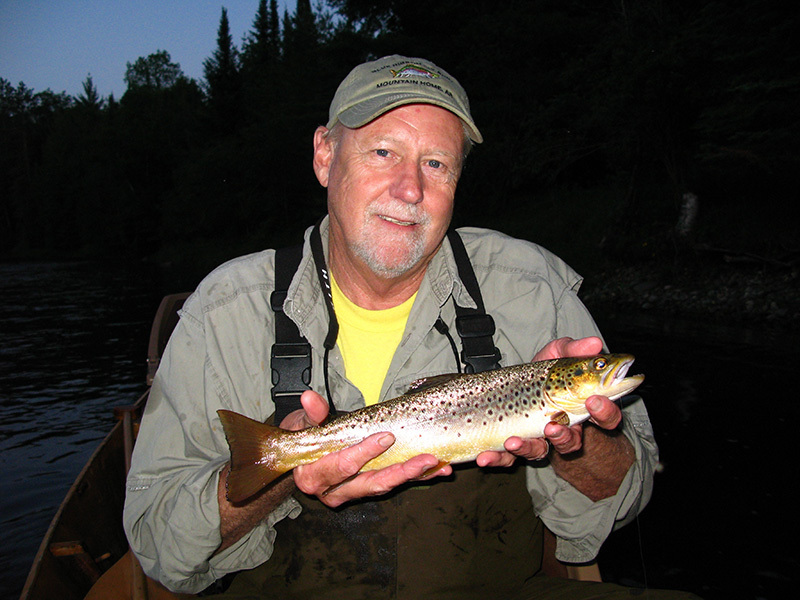 If you are nervous about wading in the dark, find another way to fish the “hatch. Your safety is important. Visit the local fly shops. Good information is usually available there. Buy something while you are there. It helps to keep the shop in business. Local flies are a good bet. This list is not complete by any means but a really good way to get introduced to the excitement of fishing the Hex hatch is hire a guide. It is an excellent way to see what it is all about. As for me, I did all of the above, had interesting experiences with angry beavers, flying bats, turkey attacks and really big fish in the dark. Here is a link to a short video which will convey some of the excitement. It was taken with an infra-red camera around midnight. 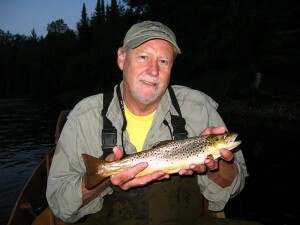 The guide is Jamie Clous from the Old AuSable Fly Shop in Grayling Mi. and the angler is Jason Randall, author of “Moving Water” and “Feeding Time”.